Twelve years after the release of the original Etrian Odyssey, Etrian Odyssey Nexus is here as a sort of season finale for the franchise. While Atlus has already teased the 'next stage' for Etrian Odyssey, Nexus will be the last one in the current two-screen format that the series has utilized so well. It's here to give the series a final sendoff before things will inevitably change for future entries on new hardware. 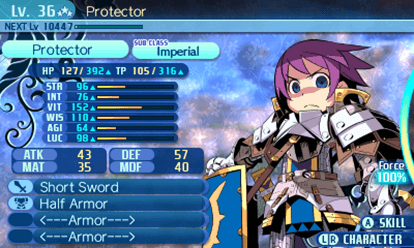 That is to say, Etrian Odyssey Nexus looks backward far more than it does forwards. 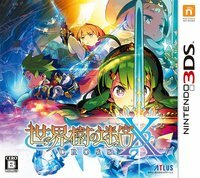 In fact, it's basically in the game's title: a 'nexus' of elements from the games up to this point, most strongly Etrian Odyssey through Etrian Odyssey IV. In a sense, this review might not actually be not a very useful one, because it's likely that those who would be purchasing Etrian Odyssey Nexus know effectively what to expect already. There's not much new or novel in Nexus; in fact, it's better to expect things that you have already seen before if you are a veteran of the series. Etrian Odyssey Nexus takes place on a mysterious archipelago in the sky known as Lemuria, where it seems various ruins from other regions (around Etria, High Laagard, Armoroad, and Tharsis) have begun to appear. Princess Persephone of the floating city of Maginia hires explorers to navigate the ruins of Lemuria in order to find a fabled treasure said to bring endless prosperity to those who claim it. 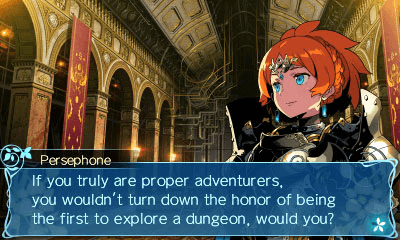 Most Etrian Odyssey games lessen the importance of narrative, letting combat and exploration mechanics drive the game forward more than a storyline push, and Nexus is no different. However, veterans of the series might be nostalgically tickled by several of the character cameos that they will find in Nexus. Characters like Shilleka (EO), Artelinde (EO2), Napier (EO3), and Wiglaf (EO4) all make appearances and play small roles in the game's storyline. Napier actually runs the town shop, so you'll see her often. Nexus is unabashedly a love-letter to the series so far, and it's certainly not trying to hide it. 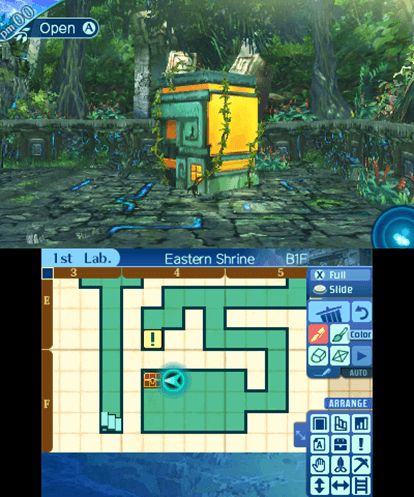 If I had to make a comparison, Nexus is most structurally similar to Etrian Odyssey IV, as the game's various dungeons are separated as mini-dungeons on a world map. However, the world map itself is not explorable; it instead is a series of nodes you can select from a menu similar to Etrian Mystery Dungeon. One of the most important things to note is that Etrian Odyssey Nexus is comfortably the longest title in the series all put together. In total, it houses 62 total maps to fill, including post-credits content. For comparison, both the Etrian Odyssey Untold games have 35 maps (including Gladsheim or Ginnungap), which would rank them at second place in total map count. So, Nexus is a bit of an endeavor to get through. As I was making my way through Nexus, its length probably doesn't do it any real favors on its own. However, having played all the other games in the series, it was delightful to revisit several map styles and music tracks from earlier games in the series. In fact, it's almost a bit ironic that the way Nexus borrows so much from previous games helps to keep things fresh. I kept wanting to play further to see what familiar music or location I'd run into next. Etrian Odyssey's musical compositions by Yuzo Koshiro are certainly one of the highlights of the series, both the high-energy battle tracks and lovely dungeon BGMs. Because Nexus borrows so much from the franchise at whole, it houses quite a variety of music. In total, Nexus has 10 different normal battle tracks (two of these original to Nexus), 7 FOE battle tracks, and 11 different boss battle tracks. Of course, many dungeon themes also make their way back from earlier games, such as the fantastic Lush Woodlands from EO4. While a lot of the music is borrowed from the Untold games, EO4, or remixed tracks from EO3 (as that never had a 3DS version to grab from), it was still delightful to hear such a wide range of music all in one game. Even some Etrian Odyssey V music makes its way into the Nexus post-game. The only unfortunate element here is that none of the music is available in the classic FM style. Several dungeons have a small gimmick to make them unique, sometimes in conjunction with various FOE enemies that are commonplace in the series. Whether it's the puddle paths of the Golden Lair (borrowed from EO4), the one-way currents from the Undersea Grotto (from EO3), or the moving platforms of the Petal Bridge (from EO2), each dungeon offers a small puzzle for players to work around in navigating the labyrinth. While the maps are not lifted directly from previous games in the series, the borrowed gimmicks certainly make them feel familiar. 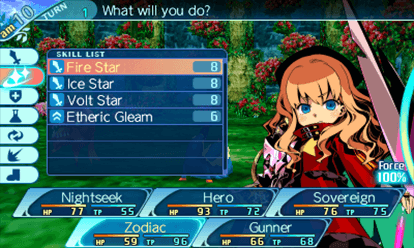 Combat is the usual round-based affair you would expect from Etrian Odyssey, using a player-created party of various classes. If you've played any EO game since III, you'll likely feel at home here. Etrian Odyssey veterans will know that party construction and coordination is always key to success, and understanding how to create complementary units is crucial in taking on the game's toughest challenges. To note, Nexus doesn't use the race or class promotion system from EO5, but instead revisits the subclassing system from EO3 and EO4. The game also reuses the Force/Boost system from Untold 2, which gives each class a special buff and ability they can use in a limited fashion. 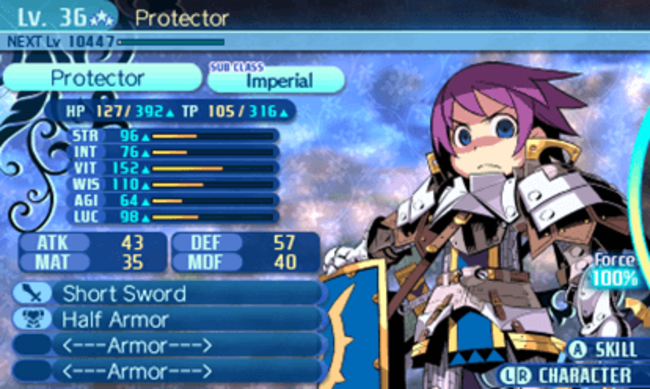 Etrian Odyssey Nexus can become a bit of a playbox for those who really love tinkering and toying with the party setup. The game has 19 total classes, 18 of which are borrowed from previous games from the series. The only entirely new class is the Hero, which is characterized by the ability to make 'afterimages' that repeat the previous action in battle. Unlike EO5 which only had two difficulty levels, Nexus has four. The easiest level, Picnic, locks the player into it for those who just want to experience the story. The two medium levels, Basic and Expert, work as your usual Normal and Hard modes and can be selected at any time. A final difficulty level, Heroic, is the same as Expert but can only be selected at the beginning of the game - it basically works as a badge-of-honor for those wanting to say they played the game front-to-back on the hardest option. I personally found playing the game on Expert was quite challenging, but not too much to be unfair. I ran into some trouble with the game's handful of post-game bosses that can really test your mettle to overcome them. Personally, my general-purpose party wasn't well suited in taking on these ultimate challenges, so I had to spend some time reconfiguring my set up in order to overcome them. Just like all EO games, taking down various challenges with a well-constructed team can be incredibly satisfying. It takes quite a bit of time to unlock sub-classes in Nexus, but once you do, your options for party customization expand tremendously. With so many permutations available, it's inevitable that some combinations of classes in a party will be considerably more effective than others. In completing the game for review, it wasn't feasible to test every set of classes, but it was immediately obvious that some combinations have game-breaking potential. A Zodiac/Imperial is a great class for wiping out normal mobs with elemental spells, while a Hero/Gunner can dish out damage quickly. My healer was a Medic/Sovereign, which could heal and buff the party whenever appropriate. It's fair to say that the sheer number of possibilities here is a bring draw to this particular title, even if it results in some poorer game balance overall. There were a few places where I was slightly disappointed in Nexus, and that is both the quest and Adventurer's Log system. By far most of the quests in Nexus simply involve gathering certain drops and returning them to the bar or store. This quest format is no doubt the most common in the Etrian Odyssey series, but I felt it was even more lopsided in Nexus. I found myself missing quests that involved less routine actions, such as optional fights or seeking out certain spots within the labyrinth - although there are few. The Adventurer's Log was also slightly less interesting than it was in its debut in EO5. This sort of mini-quest system involves the party making certain choices at spots in the labyrinth, such as whether to rest or collect food. EO5 included various race skills that would determine the outcome of these events, but it's a bit more streamlined in Nexus to the point where most of these mini-events are simply uninteresting. Neither of these elements dramatically change my opinion on Etrian Odyssey Nexus at whole, but I do think they are places that could be improved or expanded upon in whatever the future of Etrian Odyssey brings. As a separate note, Etrian Odyssey Nexus is the first voiced EO game to have Japanese voice-overs instead of English in the localized release. Characters and dialogue aren't EO's strong suit in the first place, so I don't think this is something many people will take much issue with. However, I wanted to note that there is some dialogue that is not subtitled for the player. Things like bits of shopkeeper chatter when you are working around tavern/store menus, traversal dialogue, or battle attacks - basically anything that wouldn't usually have a textbox. Of course, all story or quest content is translated. Being frank, storylines in Etrian Odyssey games really don't amount to much. They are only there offer a base premise; window dressing to the game's combat and map traversal. But I have to state, bluntly, that Nexus has one of the most shockingly dumb end-game plot twists I've ever encountered. Again, it doesn't matter much for a series like Etrian Odyssey, but this particular plot point was so ridiculous I actually had to pause and redo to the section and make sure I read it correctly (I did). Overall, my opinions on Etrian Odyssey Nexus are somewhat similar to what I felt about Etrian Odyssey V in 2017. This is clearly a game developed for existing fans of the series and it's not trying to win anyone else over. I appreciate the flexible party creation that gives players nearly full control over how they approach combat, and the map-making is as relaxing and gratifying as it usually is. It's a polished and comfortable game the fits in an established niche.